Remember that saying "Don't give up your day job", which is used in reference to the multitudes of struggling artists that have to live a "dualistic life" until they get their chance to strut around in the limelight. "Limelight", which could also be described as selling one's soul to the entertainment industry. "Dualistic life" best descibed as working your day to day grunt job running around in the hamster wheel or rat race by day to survive, while building your dream by night. Well that saying has been my credo for the last few decades. Corporate grunt by day, musican by night. Actually in my case in was the other way around. Corporate grunt by night, musician by day. Well I finially decided to give up my day (night) job to pursue my dream producing the music which has been bouncing around in my head for awhile. Back in the year 2001, the benevolent force in the universe gave me the windfall I needed to pursue my dreams, much like a black monolith from the far reaches of the universe. I was laid off from my job in Seattle as a Photo Editor for ESPN.com owned by The Walt Disney Corporation and under their cyber presence known as The Walt Disney Internet Group or WDIG. Though I loved and enjoyed my job very much, laboring into the night and early morning building photo galleries and putting the best photos I could find for the current sports news, my job did not love me quite as much. So I said "Hasta la vista" to my friend the little mouse, and moved into the country to focus on my music. I moved into a friend's guest house at an undisclosed location somewhere in the lowlands around Port Townsend, in late July. Here amongst the evergreens overlooking Discovery Bay, I set up my keyboards and began composing music with my good friend Bob Dickey, who has a penchant for creating enchanting rhythms with his drum set. During my quest through the ages to compose the music which I have felt echoing through my soul, God, has been very kind to me and brought several wonderful, talented and extremely creative people into my life. Bob is one of these fellow sojourners of the cosmic music torch. He plays the drums with an inner spontaneity and energy that can only be attributed to his many encounters with aliens. His dedication and encouragement have kept my music project alive through many a lean and uninspired passage of my musical quest. Our focus, over the next months of rehearsals, was to solidify the groove of each new tune by paying particular attention to the rhythm and emotion of the tune. I believe that every artistic creation, whether musical, literary, dramatic, or fine art, has its own entity and as such should be given the space and allowed the time to evolve into what "it" the creation wants to be. Consequently I have a somewhat looser approach during rehearsal to letting the music evolve into its own special "person". This is not to say that my songs do not have an organized structure, I just think that the more a song is played the more it evolves into its own unique form. Hence, we listened to see which direction each piece wanted to go and followed it into its own landscape. Additionally I allow enough flexibility for each song that there is an element of improvisation which also allows the music to metamorphosize as it pleases. The first week of December, we shuffled all of our gear to The Old Generator Plant for Fort Worden, which has been transformed into a wonderful and intriguing space for recording music known as Synergy Studio, thanks to the hard work of owner and head engineer Neville Pearsall. We were also very fortunate to have the assistance of Bill Stuber of Triangle Studio fame (Seattle), temporarily out of retirement, to engineer and co-produce our music. Over the next three days of recording we were able to capture some great takes on fourteen of my music compositions. Except for two solo keyboard pieces, all of the songs were recorded "live" in the studio with drums and keyboards simultaneously. Additional keyboard and guitar tracks were added via a Roland Hard drive recorder thanks to guitarist Jeff Wittekind. Five of the compositions are close to being finished and mixed. I am making three of these available on the Electric Blue Sun CD, which has additional tracks from My 1996 Cherryhill Session at Rod Young's Studio. 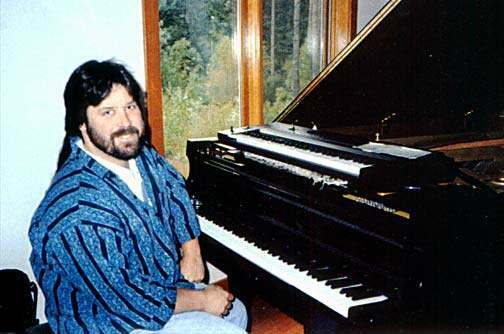 In the weeks to come (late January - Februaryish) I hope to have several new pages on the website that will include MP3 audio samples of two new acoustic piano projects and the three tunes I was able to get done from the 2001 "Two Crow Moon" project. I am hoping that his year I will secure some financing to finally finish producing the other ten compositions from that session also known as the "quite dusty, almost forgotten, buried for years, but probably coolest stuff I have recorded" project. Once again I want to thank everyone who has made this project possible. And a very special thanks to my multi-faceted webmaster Joseph Breskin whose faithful assistance has allowed me to get my music out to the world. Thanks for listening to the music; Fresh tunes are on the way.